Parts of the northwest may be known for the rainy season, but the high desert town of Bend sure isn't one of them. Bend experienced tremendous growth during the recent real estate boom, and has subsequently suffered from its bust. Many developments built in last decade came with golf courses attached and now the area is loaded with golf courses. Pronghorn Golf Club is the most recognized name here, and recently opened its Nicklaus course to the public. Brasada Ranch was built with the intention of making Top 100 lists and drawing in more residents and golf members to the Bend area, though most of the new real estate ventures here have stalled in recent years. Not all golf around Bend is in the high desert. Head up into the foothills of the Cascade mountains to a Top 100 regular listing: Crosswater at Sunriver Resort, a Bob Cupp design that's tough enough to host a Champions Tour major event. In the tiny village of Sisters around the corner from Bend, family-run Aspen Lakes Golf Club is an affordable, modern-designed course where the locals like to play. 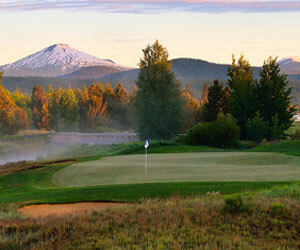 Black Butte is an older, understated golf resort where the "new money" feel of Bend's new, upscale developments is long gone. For golfers, Bend can be played year round, though winter temperature highs stay in the 40s, but average rainfall never goes higher than about an inch a month, so your best bet for sunny golf is here in the Great Basin High Desert Plateau.